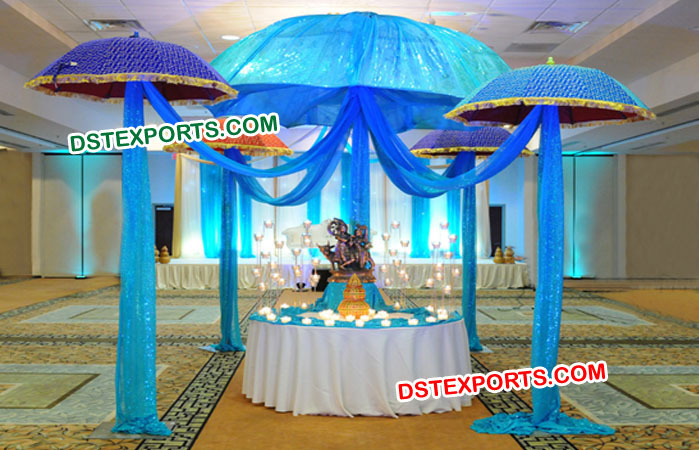 We Manufacturer and Exporters all types of wedding decoration as Wedding Umbrella .We have all types of umbrellas Heavy Embroidered Umbrella, Plain valvet colorful Umbrella with Hanging Tassels, Red Embroidered umbrellas with hanging crystals and lace, Umbrella wedding fiber umbrella, wedding hanging crystal umbrella, Patch work Umbrella, Wedding umbrella with hanging tussles, Parasols crystal umbrella, wedding Red embroidered umbrella with Sequins, Rajasthani wedding umbrella, jaipuri wedding Umbrella, Embroidered multicolor umbrella, Indian wedding umbrella, Mehandi stage decoration umbrellas, Colorful wedding chatars, Muslim wedding umbrella, Pakistani wedding umbrella, Arabian wedding umbrellas, Designer wedding umbrella, Muslim Wedding Stage Umbrella. it is designed with golden thread ,shining stars and golden kinari on valvet cloth. with embroidered work on it in multicolor designs.